Stand up right now and walk around for a minute. We’re pretty sure you didn’t see everywhere you stepped nor did you plan each step meticulously according to visual input. So why should robots do the same? Wouldn’t your robot be more versatile if it could use its vision to plan a path, but leave most of the walking to the legs with the help of various sensors and knowledge of joint positions? That’s the approach [Sangbae Kim] and a team of researchers at MIT are taking with their Cheetah 3. They’ve given it cameras but aren’t using them yet. Instead, they’re making sure it can move around blind first. So far they have it walking, running, jumping and even going up stairs cluttered with loose blocks and rolls of tape. Two algorithms are at the heart of its being able to move around blind. The first is a contact detection algorithm which decides if the legs should transition between a swing or a step based on knowledge of the joint positions and data from gyroscopes and accelerometers. If it tilted unexpectedly due to stepping on a loose block then this is the algorithm which decides what the legs should do. The second is a model-predictive algorithm. This predicts what force a leg should apply once the decision has been made to take a step. It does this by calculating the multiplicative positions of the robot’s body and legs a half second into the future. These calculations are done 20 times a second. They’re what help it handle situations such as when someone shoves it or tugs it on a leash. The calculations enabled it to regain its balance or continue in the direction it was headed. There are a number of other awesome features of this quadruped robot which we haven’t seen in others such as Boston Dynamics’ SpotMini like invertible knee joints and walking on three legs. Check out those features and more in the video below. Of course, SpotMini has a whole set of neat features of its own. Let’s just say that while they look very similar, they’re on two different evolutionary paths. And the Cheetah certainly has evolved since we last looked at it a few years ago. One of the features of fancy modern industrial motor and controller sets is the ability for the motor to act as a mass-spring-damper. For example, let’s say you want a robot to hold an egg. You could have it move to the closed position, but tell the controller you only want to use so much force to do it. It will hold the egg as if there was a spring at its joint. Another way you could use this is in the application of a robot leg. You tell the controller what kind of spring and shock absorber (damper) combination it is and it will behave as if those parts have been added to the mechanism. This is important if you want a mechanical leg to behave like a biological leg. [Ben] had worked on a more formal project which used some very expensive geared motors to build a little running robot. It looks absolutely ridiculous, as you can see in the following video, but it gives an idea of where he’s going with this line of research. He wanted to see if he could replace all those giant geared motors with the cheap and ubiquitous high performance brushless DC motors for sale now. Especially given his experience with them. So far he’s done a very impressive amount of work. He’s built a control board. He’s characterized different motors for the application. He’s written a lot of cool software; he can even change the stiffness and damping settings on the fly. He has a single leg that can jump. It’s cool. He’s taking a hiatus from the project, but he’ll be right back at it soon. We’re excited for the updates! 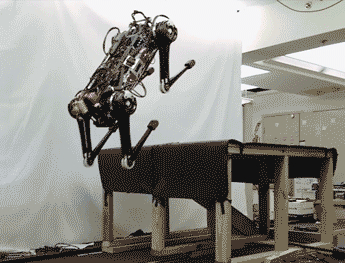 Researchers over at MIT are hard at work upgrading their Robotic Cheetah. They are developing an algorithm for bounding movement, after researching how real cheetahs run in the wild. Mach 2 is fully electric and battery-powered, can currently run at speeds of 10MPH (however they’re predicting it will be able to reach 30MPH in the future), and can even jump over obstacles 33cm tall. We originally saw the first robotic Cheetah from Boston Dynamics in cooperation with DARPA two years ago — it could run faster than any human alive (28.3MPH) but in its tests it was tethered to its hydraulic power pack and running on a treadmill. It’s unclear if MIT’s Cheetah is a direct descendant from that one, but they are both supported by DARPA. The technology in this project is nothing short of amazing — its electric motors are actually a custom part designed by one of the professors of Electrical Engineering at MIT, [Jeffrey Lang]. In order for the robot to run smoothly, its bounding algorithm is sending commands to each leg to exert a very precise amount of force during each footstep, just to ensure it maintains the set speed. [Boston Dynamics] has been just full of videos over the last few days. They’ve dropped updates on Atlas and LS3 in addition to the WildCat update we already featured. This video shows updates to the Atlas robot. This is to be a simplified version of the atlas, as compared to the robots sent off to competitors in the DARPA robotics challenge. Arms have been replaced with weights. It appears that this update focuses on Atlas’ balancing and handling on rough terrain. Atlas walks gingerly, over some crushed cinder blocks – possibly the same ones we saw BigDog throwing around recently. There are a few tense moments, but Atlas manages to get through unscathed. Reminiscent of the early videos of BigDog, WildCat is currently powered by an internal combustion engine. The engine drives a hydraulic system, which then actuates the robot’s legs and front/rear pods. The beauty of a system like this is that switching to an electric motor is simple – just replace the IC engine. While we’re sure this would make a much more stealthy cat, weight and run time could be issues. Moving the power system onboard has also slowed down WildCat a bit. Cheetah was able to reach 28 MPH while WildCat can only muster 16 MPH. WildCat is part of DARPA’s maximum mobility and manipulation program. The research appears to be focused on improving the gaits the robot uses to move at various speeds. The video highlights both bounding and galloping. Slo-mo sections show all four of WildCat’s legs leaving the ground, which is the suspension phase of a classic gallop gait. Control isn’t perfect yet, as WildCat tumbles at one point in the video. It gets right back up though – ready for more.